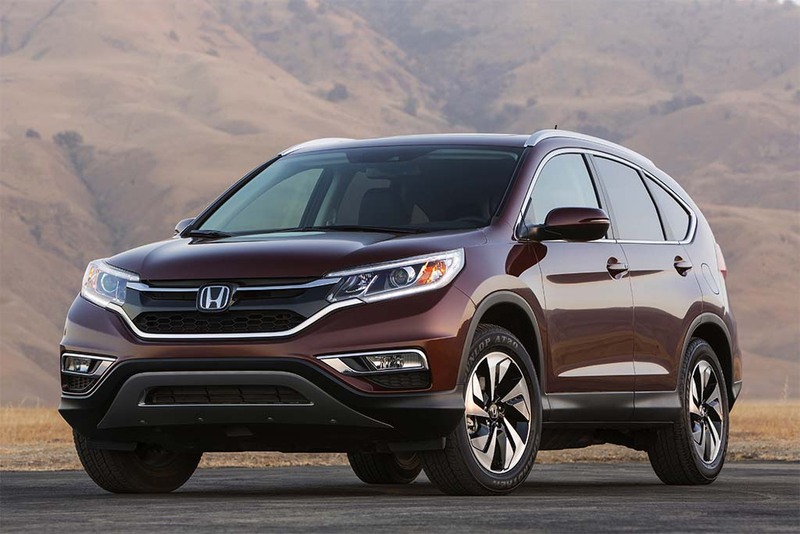 The 2015 Honda CR-V is a five-passenger crossover SUV offered in LX, EX, EX-L and Touring trim levels. This entry was posted in CRV Articles, Winter Articles on February 4, 2015 by Administrator. BLUE MOUNTAIN, Ont. — If you want to know a man, don’t bother walking a mile in his shoes. Never mind J.K. Rowling’s advice of watching “how he treats his inferiors.” And Googling his every post on social media is a complete waste. Facebook and Twitter are increasingly — as Linkedin has always been — just our professional faces digitized, a constantly refreshed curriculum vitae if you will, highlighting only those specific aspects of our personal life that we’re willing to share with people we barely know. Hardly what one would call a window into the soul. If you really want to know someone, what you really need is their cellphone. In this, the mobile age, the iPhone is that most personal of devices, the one that never leaves our side, the last thing we see before going to sleep and the first thing we check when we wake up. Marshall McLuhan’s message is just as apropos today as it was 50 years ago. And, for our generation, the medium has a four-inch touchscreen. So, for instance, I know that Hayato Mori is not just another cookie-cuttered, two-dimensional management drone. Oh, Honda Canada’s senior manager of product planning and business development is outwardly the epitome of Japanese efficiency and decorum; no detail of Honda high-techery is beyond his grasp, no market analysis not immediately at his fingertips. But beneath that well-accoutered veneer of corporate respectability beats the heart of a rebel. An aging — he is after all 44 years old — rebel perhaps, but there’s a little of the Marlon Brando somewhere in there. How do I know? Why, his phone, of course, which you would know, if you were sitting beside Mori in his new CR-V as he patiently describes Honda’s latest “linking” technology, completely chock-a-block with ’90s hip hop and rap. Surf all the channels his Aha app has bookmarked and you’ll find Hip Hop Throwbacks, Hip Hop Resurrection, ’90s Hip Hop and a compendium of seemingly every Internet radio station devoted to Notorious B.I.G. and Tupac. Driving around in a steadfastly mainstream CR-V with the nattily attired Mori listening to the big bass beat of Hypnotize is to have yet one more stereotype demolished. And the reason for this illumination is that Mori (graciously, considering this intrusion) offered up his phone to showcase one of the new-for-2015 CR-V’s signature technologies, HondaLink. 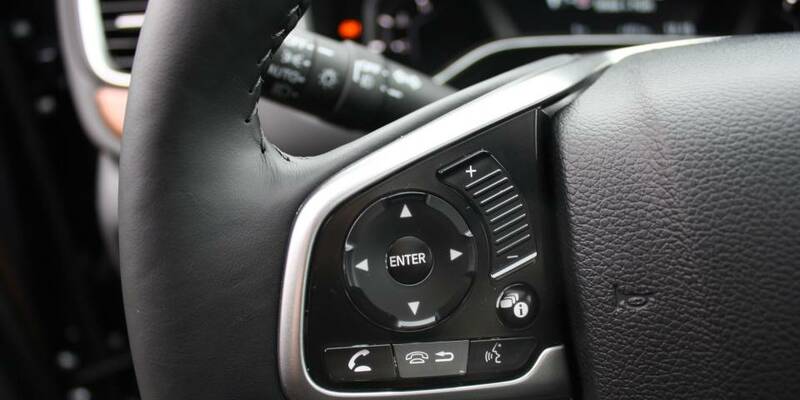 Designed, at least in the CR-V’s case, as a low-cost alternative to onboard computer systems, HondaLink allows the cost conscious CR-V owner to use their cell phone’s computing power in place of a high-priced onboard infotainment system. Thus, by hooking up Mori’s iPhone 5 — no simple task as it not only requires a typical Apple “lightning” connector but also a speedier HDMI cable for all the data to be transferred — to the centre-console-mounted LED screen, the dashboard becomes an extension of his persona. 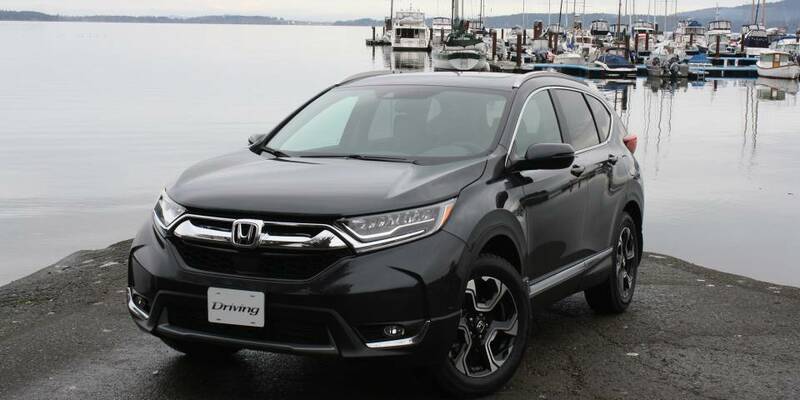 The most important “app” offered (all are available through iTunes) is, of course, the navigational aid, an option typically costing $1,000 or more and, in the specific case of the CR-V, only available on the top-of-the-line $35,790 Touring edition. Hook up your phone and not only do you have a cheaper directional widget, but considering the power of the modern mobile, probably a more powerful one as well. HondaLink also offers the Aha music app — where I discovered Grand Master H’s secret hip-hop obsession — and a few other apps, but it will be the navigation system that is the biggest benefit to CR-V owners. As novel and cost-effective as the new HondaLink system is, it is hardly the only high-tech feature ladled into this year’s mid-model-cycle makeover. 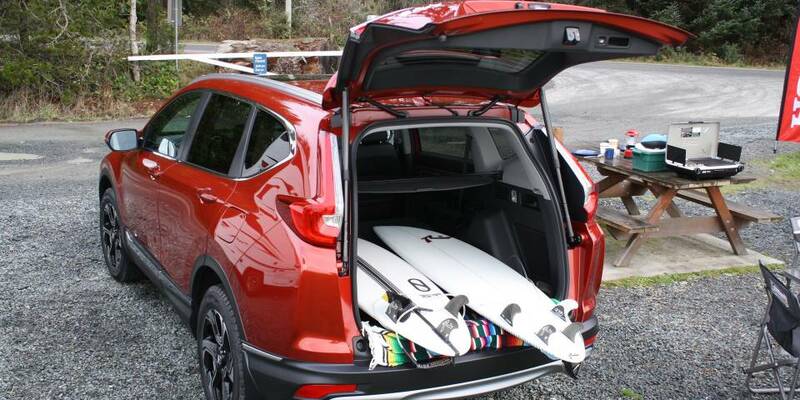 Indeed, if there’s a theme to the 2015 CR-V — besides styling revisions that make it look less like a wimpy minivan and more like a butch SUV — it’s that Honda is using its remake as a showcase for its new suitcase of high-techery. 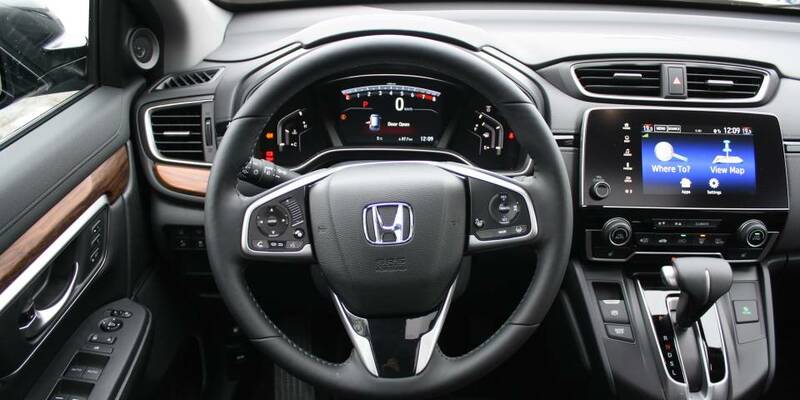 Besides HondaLink, the ’15 CR-V features a suite of driver-assisting technology called Honda Sensing. Onboard cameras and radar offer the becoming-commonplace-but-not-at-this-price adaptive cruise control system, which automatically maintains a set distance to the car in front, a Forward Collision Mitigation apparatus which automatically applies brakes in the case of a collision and Lane Keeping Assist which gently guides you back into your lane if the CR-V goes walkabout. The most popular of the new technologies, however, is the LaneWatch system we first saw on the Accord, a camera mounted on the passenger-side mirror expanding the driver’s field of vision from the 20 degrees typical of most mirrors to a whopping 80 degrees. It’s a novel system, extremely useful and my vote for technology of the year. Less noticeable — especially if you’re just perusing the specification sheet — is that the CR-V’s engine is also all-new for 2015. Oh, it still tops out at 185 horsepower, but dig deeper and you’ll discover that it’s been Earth Dreamed, Honda’s rather pretentious appellation for its eco-friendly internal combustion technologies. So, while yes, the 2.4 litres remains the same, the little four-banger is now direct injected, the compression ratio has been raised to a motorcycle-like 11.1:1 and has some new fangled offset-cylinder technology. It’s enough for Honda to claim, despite the stagnant horsepower, an increase in performance thanks to the 18 pound-feet bump in torque (for a total of 181 lb.-ft.) and 16% better fuel economy (when comparing this year’s five-cycle testing with an estimate from last year’s two-cycle tested model). Honda claims the CR-V will be the most parsimonious sport-cute in its class. Part of that significant improvement comes from the continuously variable transmission (CVT) that replaces the outdated five-speed automatic. With a 33% wider gear ratio spread, not only does the new CR-V have more jump off the line, but it also revs lower on the highway (contributing to the comparatively frugal 7.2 L/100 km highway rating for the all-wheel-drive Touring edition). Best of all, unlike most such transmissions, Honda’s CVT doesn’t transform the CR-V into a loud rasping rattletrap (when accelerating, typical CVTs keep the engine’s rpm constant which can be extremely annoying, especially on four-bangers). Indeed, below 4,000 rpm, you’d never know the CR-V’s 2.4L is hooked up to anything other a conventional transmission, the highest compliment one can pay to a continuously variable version. Indeed, like most Hondas, there is precious little about the CR-V to denigrate. It is not a stylistic leader, but the 2015 refresh has minimized the maudlin. The engine, on paper no more powerful than before, feels decidedly peppier and is more frugal to boot. The interior, especially on my Touring model, is vastly upgraded with swaths of leather, a premium audio system, soft-touch materials and, of course, all that high-tech gadgetry. That the Touring edition, the pinnacle at the top of the CR-V lineup, is fully optioned out at $35,790 also represents something of a bargain; some of its competitors — even from supposedly budget-oriented brands like Hyundai and Jeep — regularly top-out over $40,000. And, of course, lesser models such as the $29,970 SE and $31,790 EX offer that cost-effective HondaLink system. With or without hip hop. It is, as defined by our often-eccentric French cousins, an internal combustion engine deliberately unbalanced. An engine in which the pistons are, again, deliberately out of line with the crankshaft that they ride on. The technology, désaxé (literally “unbalanced in our other official language), deliberately renders an engine asymmetric, upsetting its natural balance and causing more vibration. And, yes, Honda has incorporated it into the new-for-2015 Honda CR-V’s “Earth Dreams” 2.4-litre inline four. ine also offsets its pistons some 8.0 millimetres from the crankshaft centreline. However, there is a method for this seeming mechanical madness; beyond the added vibration that results (which the Earth Dreams uses balancing shafts to quell), having piston and crank out of line greatly reduces friction. Pictures telling a thousand words, it’s rather easy to see that, in the conventional engine to the left, when the piston is being forced downwards by the combustion forces, the connecting rod’s angularity causes some of the resultant force to press the piston sideways against the cylinder wall. More angularity equals more friction and hence poorer fuel economy. The second orientation has the connecting rod parallel to the piston and cylinder. No side thrust. No friction. Improved fuel economy. Honda says the Earth Dreams version of the 2.4L is some four percent more efficient than the engine it replaces. 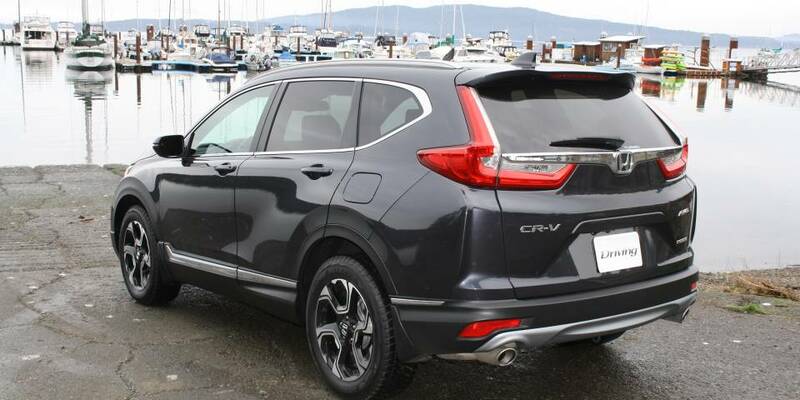 Overall, Honda Canada says the 2015 CR-V’s fuel economy is improved some 16% thanks to other new technologies like the new continuously variable transmission. The company also expects the AWD version’s 8.3 L/100 km overall fuel economy (in the new 5-cycle rating system) to be best in class. This entry was posted in CRV Articles on January 15, 2015 by Administrator. Honda has had to take a couple of mulligans lately. When the ninth-gen 2012 Civic launch fizzled, the car got a do-over for ‘14, bringing much-needed styling and powertrain upgrades. Similarly, the fourth-gen 2012 CR-V missed the small-overlap crash-test boat, earning a “marginal” rating that nixed its chances at the coveted Top Safety Pick ranking. It also drew criticism for being less fun to drive than its rivals, due in part to its quaint old five-speed automatic. The fix: a 2015 reboot, and a second chance. We’re open-minded about second chances – mid-cycle fixes earned the 2010 Fusion our Car of the Year calipers – so let’s see how Honda’s redemption-edition CR-V stacks up against the criteria. 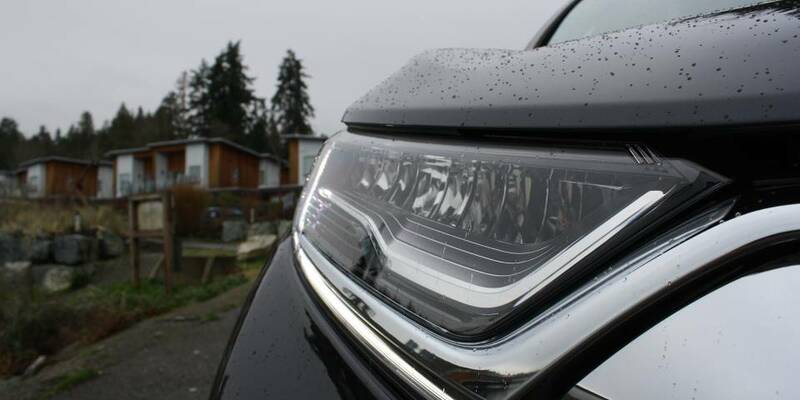 In nine pages of compiled notes from nine judges, the few references to the CR-V’s exterior design ranged from MacKenzie’s “Not the most beautiful or innovative C-segment SUV design, but not the worst, either,” to Evans’ “Not a big fan of the latest styling updates.” Then again, design was low on the priority list this time around for a vehicle that continually outsells its rivals to rank as the best-selling entry CUV ever. And at least nobody reviled it, as some did the chrome-beaked Cherokee. The interior design is equally staid, but its ergonomics generally drew praise, except for the infotainment system, which was universally reviled for its lack of knobs, unintuitive function, and graphics that don’t match those on the other various screens. Our youngest judge, Seabaugh, reckoned that his peers would liken the difference between the CR-V and Jeep systems to that of “an old T-Mobile Sidekick and an iPhone 6.” It does boast a segment-first HDMI input, but none of us can imagine wanting to sit in a parked CR-V and watch a movie on a dash screen that’s smaller than an iPad. Ah, now here’s a criterion Honda can sink its teeth into. Powertrain revisions tasked with improving the fun quotient include a new “Earth Dreams” 2.4-liter engine that gets direct injection and a commensurate compression bump from 10.0:1 to 11.1:1, along with a new, lighter die-cast aluminum block (with the same bore and stroke) and myriad friction reductions. Horsepower still peaks at 185, but does so 600 rpm earlier (at 6400), with torque jumping from 163 lb-ft at 4400 rpm to 181 lb-ft at 3900 rpm. Nail the gas to pass and the trans delivers a snappy downshift to the power peak. The switch to direct injection and a continuously variable transmission with a 33 percent broader ratio range than the old five-speed should boost fuel efficiency pretty notably, and indeed the combined 26/33 mpg EPA city/hwy figures represent an improvement of about 12 percent. But our Real MPG results are disappointingly similar to those of our last CR-V automatic with AWD: 20.6 city/28.7 highway/23.6 combined mpg, compared with last year’s 20.5/28.9/23.6 (its EPA ratings were 22/30/25), so it’s unclear whether you’ll realize all that improvement. We eagerly await a chance to test out another not-so-early-build example. Here again, there’s been no official IIHS testing to report, but we’re told the engineers reinforced the CR-V’s occupant compartment with additional hot-stamped high-strength steel, and modified the engine compartment crash structure to better absorb the energy in small-offset crashes. Presuming their computer simulations have accurately predicted what IIHS will measure soon, the Top Safety Pick hurdle should be cleared. The available Honda Sense suite of camera/radar-based safety gear, including Collision Mitigating Braking Support, Lane Departure Warning, Lane-Keeping Assist System, and adaptive cruise control, are the “plus” cherry on top. LKAS had every editor raving. “An amazing piece of technology for the segment,” said Seabaugh. “The steering straightens you out; it doesn’t send you ping-ponging down the road,” concurred Loh. The LaneWatch camera we’ve seen on Odyssey, Accord, and Civic arrives here too, displaying a blind-spot view of the right side of the car whenever that turn signal is on. LaneWatch comes with the EX trim level, but you have to pop for the new top-level Touring trim ($32,350-$33,600) to get Honda Sense goodies. Whatever you spend on a CR-V, IntelliChoice reckons you’re getting a pretty good deal. It rates the current car Excellent in terms of cost of ownership, with five-year total operating costs averaging $32K-$35K – $4300-$4500 less than the class average. Honda’s legendary resale value is largely responsible. Comparing the current CR-V’s costs with the averages in our August 2013 Big Test of a similarly equipped Ford Escape, Mazda CX-5, Subaru Forester, and Toyota RAV4, the Honda depreciates 13 percent less, with maintenance, repair, and insurance costs averaging 10 percent less. Some years, a vehicle wins our calipers almost unanimously. This year our jury entered the final discussion split almost down the middle. 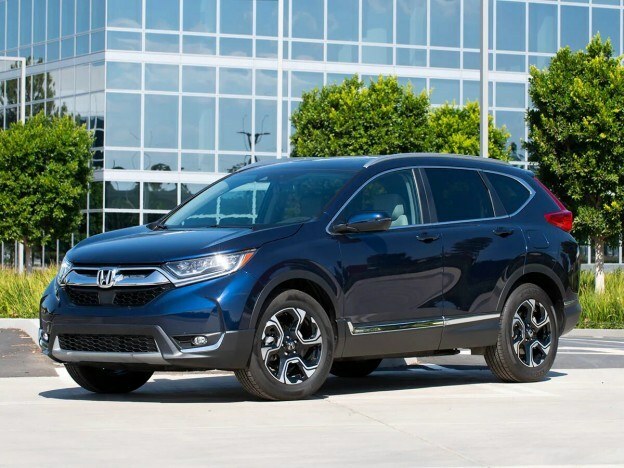 After two hours of contentious debate, the CR-V’s stellar value, engineering, and safety features combined with the cheerful way it performs its intended functions earned Honda the win. Arguments such as these tipped the balance: “The CR-V shows you don’t have to lose the fun factor when buying something economical,” said Lago. “A careful rework of a best-seller, executed with typical Honda thoughtfulness,” echoed MacKenzie. Score another win for redemption. Since its introduction to the North American market in 1996, the Honda CR-V has been a consistently strong seller for the Japanese company and, as things turned out, one of the most reliable cars on the road. In 2007, Consumer Reports ranked it as the second-most-dependable compact SUV on the market, and it is sold in countries around the world. Not hard to understand why. The CR-V was, and is, the epitome of driver-friendliness. Easy to drive, comfortable, dependable, affordable, thrifty and versatile. It’s not the kind of vehicle that makes you sit up and bark, but for mainstream buyers, it’s exactly what the doctor ordered. In 2007, the CR-V underwent some changes. It became more powerful and larger, got a restyling job and was more refined than before. It was offered with 2WD or AWD, and fuel consumption on the AWD was only a titch higher than the FWD version. Engine output was now up some six hp over 2006, and transmission choice was a five-speed automatic only. 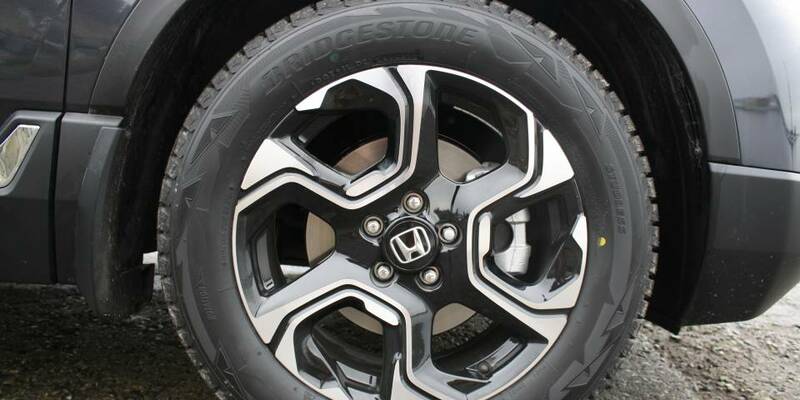 Honda called the AWD system on the CR-V “Real Time” 4WD and it was about as unobtrusive as these arrangements get, with a front-drive bias until the wheels need more traction, at which point a power takeoff unit located adjacent to the transmission sends more torque to the back wheels via a driveshaft. This was definitely not a heavy-duty 4WD setup, but it has always done the job. Aside from its almost ironclad dependability, one of the CR-V’s strongest selling points has been its drivability and user-friendliness. From the beginning, this has been one of the most car-like SUVs on the market, and it is no surprise that a sizable proportion of CR-V buyers are female. It’s also safe to say that most typical CR-V buyers place reliability and value for money over things like engine displacement, towing capacity, or how quickly you can get from zero to 100 km. Then, as now, the CR-V is the compact-ute for people who don’t really care about cars. Coincidentally, one of my neighbours bought a CR-V new in 1997 and sold it last year, with almost 400,000 trouble-free kilometres on the odometer. “It was still running like a clock when I sold it,” she said. The CR-V came in two basic trim levels in 2007: LX and EX. 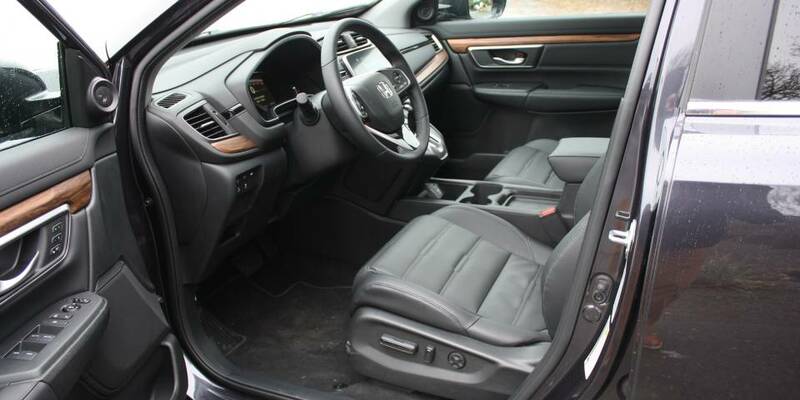 Equipment level was reasonably high on the LX, and you got air conditioning, power door locks, power seats, tilt/telescoping steering, remote keyless entry, 60/40-folding rear seats and a full roster of safety features for its $27,700 base price. You could also order things like leather interior, heated front seats and a DVD-based navi system with the top-of-the-line EX-L model. One handy little feature: front-seat armrests. 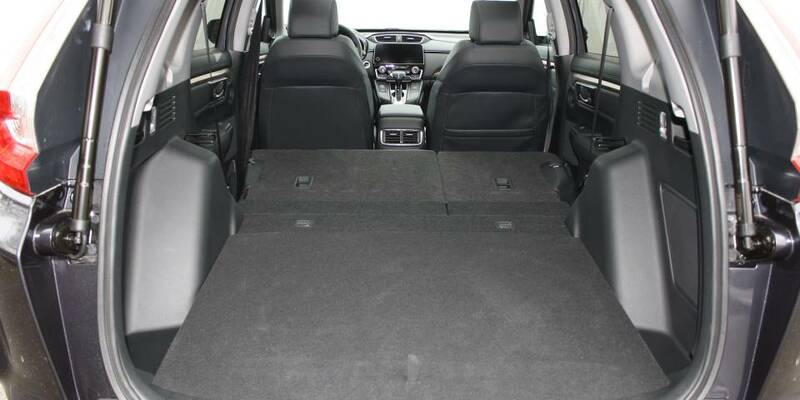 With the rear sets folded down, the CR-V provided some 2,064 litres of total cargo space. This was less than the same vintage of Toyota RAV4 or Hyundai Santa Fe, but for most people in this market, it was all they needed. Honda has known from the beginning what compact SUV buyers look for and the CR-V has always given it to them. No safety recalls to report either from Transport Canada or the U.S. National Highway Traffic Safety Administration. NHTSA, however, does list 12 technical service bulletins for this vintage of CR-V. These include windshield wipers that won’t “park” correctly, front-seat issues and incorrect labelling. There was also that false odometer reading class action suit with some vehicles, but Honda dealt with it. Aside from some minor gripes regarding lacklustre performance, market research firm J.D. Power gives the 2007 CR-V high marks in virtually all categories. As well as garnering this organization’s awards for “Most Dependable Compact Multi-Activity Vehicle,” “Highest Ranked Multi-Activity Vehicle In Initial Quality” and “Most Appealing Compact Multi-Activity Vehicle,” the 2007 CR-V get top marks from J.D. Power for overall dependability. No great surprise then to learn that the CR-V has held its value well. You’ll be lucky to find a base 2WD model for less than $16,000 these days, and a well-appointed EX-L fetches at least $20,000.